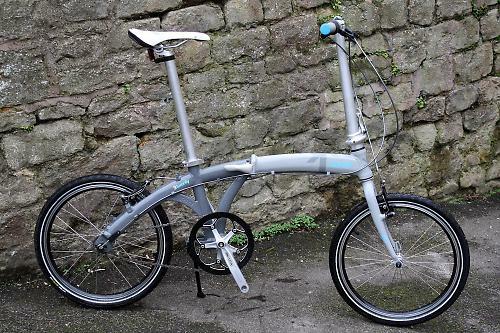 The Kansi 3twenty is the mid-range machine in a new family of UK-designed folding bikes. As well as this 3-speed, there's a singlespeed with a coaster brake, the 1twenty, and 9-speed derailleur version, the 9twenty. They share the same frame. It looks like a Dahon Mu, although there are some subtle differences. 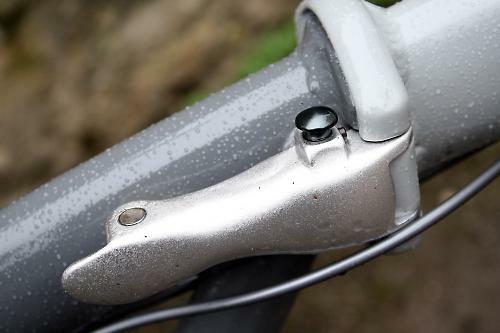 The chainstay shape and cable run are different, and the steerer folds differently. The main difference, however, is the marketing. It's the only folder that I've seen advertised on big posters at train stations. 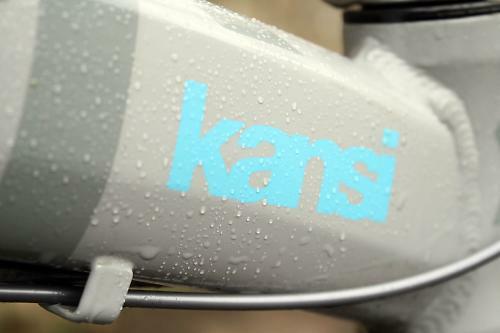 Kansi have put a lot of thought into the way their folding bike looks and what sort of people might be attracted by the bike's image and what the brand promises. I kind of like that; it's certainly a fresh way of thinking. Kansi say their folders are 'bikes that ride well, fit into our lifestyles and reflect our personalities'. By that they mean you can colour-coordinate your bike. The mykansi box is a free pack with different colour decals, grip collars and end-caps. All you have to do to get it is register your Kansi online. As well as the free pack, Kansi will upgrade your warranty to three years, which is very nice indeed. You can even get mudguards that match your frame colour - for example, a grey one to match the rear triangle and a white one to match the front part of the frame and forks. I was surprised at how many people came up to me to ask about the good-looking folder I was sporting. So much for the looks. How does it ride? The hinges hold the frame solid and it handles perfectly fine. It's not going to set the world on fire: it's still a small-wheeled folder with little forward extension for its stem. Steering is a bit trickier, especially cornering slowly and negotiating stationary traffic. Granted, the wheelbase is a bit longer and the head angle a bit more relaxed than other folders, which makes the steering a little less twitchy. And it does cruise very nicely once up to speed. Stopping and slowing down is taken care off by a couple of Avid Single Digit V-brakes. These work very well, relative to the brakes of other folders. Compared to your big-wheeled bike you will still find yourself descending more gingerly, especially in traffic. You get the feeling that if you had to slam on the brakes suddenly at speed you might end up doing an endo. The 3twenty has Sram T3 hub gears. I am all for hub gears, particularly on this type of bike. There's less maintenance, fewer bits exposed that can go wrong, and the chain is further from dirty roads. But 3-speed? It will be fine if you live in the flatlands. I don't. I live in Bath, on top a hill. Even after gearing down to a 39-tooth chairing, the range was inadequate. I got up the hill. It just wasn't pleasant sweating my way to the top in civvies. To be fair, the 9twenty would have suited me fine, and that's the one I'd have chosen if I were buying a Kansi. The 3-speed hub has been around for a century and is durable and efficient. Sram T3 hub gears themselves have a good reputation too. I found that the gears worked flawlessly as long as I was gentle. You need to back off the pressure on the pedals for the gears to shift. On the plus side, you can change gears while stationary. 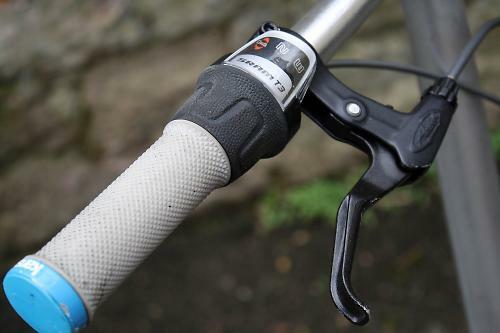 Shifting is via a twistgrip control. There's no chain tensioner; you take up any slack by moving the wheel back in the rear-facing track dropouts. Kansi haven't compromised the finishing kit. 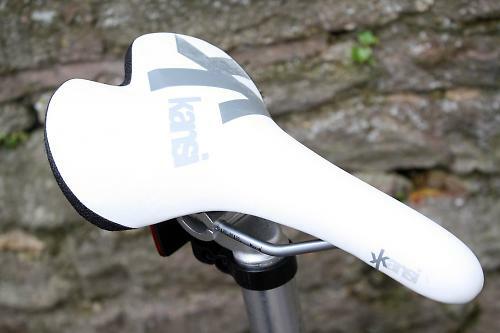 The saddle is very comfortable and the handlebar grips feel nice to the touch. White isn't the best choice. After a couple of months of use the grips aren't so white anymore and the graphics on the saddle are starting to wear off. There aren't any accessories apart from a kickstand, which I found surprisingly useful. The frame has bosses for mudguards and racks, but these don't come as standard. Ride quality is only half the story with a folding bike, of course. It's important how well and quickly the bike folds, and how portable the resulting package is. It's easier to fold the Kansi than many folders because of its kickstand. You just pop the bike on its stand, lower the saddle, flip the handlebars down, and fold the frame. The folded package stays upright on the stand, although it has a tendency to fall over without it. The Kansi's fold is not as compact nor as well designed as the Brompton's. It's on a par with my Dahon. Carrying the folded package is okay, provided you're happy to lean the bike against your leg. It's easy enough to fit in the boot of any car, or take on the bus or the train. One feature that I did really like is that both the frame hinge lever and the steerer hinge lever have a push-button locking mechanism, which prevents unwanted folding. Overall, the Kansi looks good and rides well. I would prefer more emphasis on function than form: mudguards as standard and a 7- or 8-speed hub gear would really improve this bike for me. But if you're after a stylish folder and you don't have hills to worry about, this one's a good bet. Kansi reckon it's for not too hilly commuting and across town journeys. They also say "we want bikes that ride well, fit into our lifestyles and reflect our personalities." If you want a stylish folder, then this might be for you. It's got a slightly longer wheelbase and more relaxed angles than most folders, making it a bit more stable. The bike was comfortable enough for a folder. I didn't experience any toe overlap. The bike handles fine at cruising speeds but can be a bit twitchy at low speeds. This is the same for all folders that don't have a stem to speak of. I particularly liked the saddle. The hub gear works fine, but you do have to be careful when shifting. It's not built for winning sprints. Did you enjoy riding the bike? I liked cruising on the flat, I didn't like hoiking up hills. Would you recommend the bike to a friend? If they were after a good looking folder I would certainly recommend looking at the Kansi range.